If you are a resident of Thousand Oaks and looking for the best appliance repair services, Lerman Appliances is your one-stop shop. 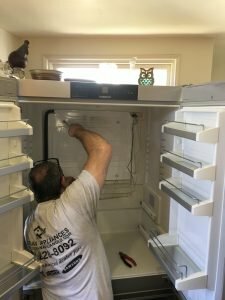 We are a reputed name for unparalleled Thousand Oaks appliance repair services. No other company that offers services for appliance repair, Thousand Oaks can match our standards. At Lerman Appliances, we aim to provide the best experience to our customers. Thus, we go above and beyond the regular industry standards and believe in walking an extra mile to facilitate our clients. Therefore, if any appliance in your home has turned faulty or is not working correctly, contact us, and we will be there at your service. Lerman Appliances is a family run business that excels in repair different types of appliances. Whether it is a dishwasher or a deep freezer, a refrigerator or a washing machine, you can contact us for quick and effective repair services. Our repair technicians are licensed and trained. Our professional technicians have years of experience under their belt, which they utilize properly to provide exemplary repair services. In addition to that, they have access to cutting-edge tools, equipment, and data to repair the appliances in the most professional way. We have also equipped them with genuine factory parts. So if a part of your appliance needs to be replaced, there will be no last-minute hassles and rush as superior quality parts will be readily available. The rates of our Thousand Oaks appliance repair are fair. This is another major contributing factor in the popularity that Lerman Appliances enjoys. We believe in providing our clients with an extraordinary experience; therefore, our technicians thrive to do their best and complete the repair job as soon as possible. We follow a thorough professional and customer-oriented approach. It allows us to focus on each client personally and provide them with our most skilled services. Furthermore, availing our services is a hassle-free process. Our technicians will be there at your specified address at the scheduled time with all the required repair supplies, equipment, and tools. We take pride in having a 100% success rate. Whether it is a minor fault or a major one, you can trust us for highly specialized appliance repair services. Our professionally trained and experienced technicians will have an in-depth look at the faulty appliance and offer a viable solution for its repair. The use of superior quality tools and parts will enhance the durability and lifespan of your appliance. We are also known for the superior customer support services we offer. So hurry up and avail our most economical and proficient appliance repair services. For more information on the services we offer or to get an idea of our rates, feel free to contact us at 818-510-4851. Our customer care representative will provide you with all the information you require. You can also email us at LermanAppliances@yahoo.com.